Sacerdotus: Easter Sunday - Christ is Risen! Alleluia Alleluia! Easter Sunday - Christ is Risen! Alleluia Alleluia! Jesus Christ has risen! Alleluia Alleluia! Today we celebrate Easter Sunday, the day Jesus rose from the dead showing He is Lord of the Living and the Dead; showing He is the God of gods, King of kings and Lord of lords! Those who hope in Him will too rise. God is not a liar. He promised that the 'temple (His body)' would be destroyed and in 3 days He will build it up again. Easter is the most important day in the Catholic liturgy. This is because the Resurrection shows Jesus was not a fraud. Many claimed to be the Messiah but were not. So those expecting the Messiah during Jesus' time were skeptical of anyone claiming to be him. Jesus by rising from the dead showed in fact that He was the ONE the Jews were waiting for. He was the Messiah and Savior. As St. Paul says in 1 Corinthians 15:14 "If Christ has not been raised, then our preaching is in vain and your faith is in vain." In other words, if Jesus never rose, then Christianity would have been a fraud. How can we have faith and hope in a man who died and never came back? How can a dead man save us? However, Jesus was no fraud or magician. He was the real deal. He was indeed the Incarnate Word - the Son of God made flesh. He was indeed God in human form. We in the Church celebrate this day with great joy. We renew our Baptismal promises and with renewed faith and hope return to our homes, neighborhoods, schools and places of work to share them in charity. 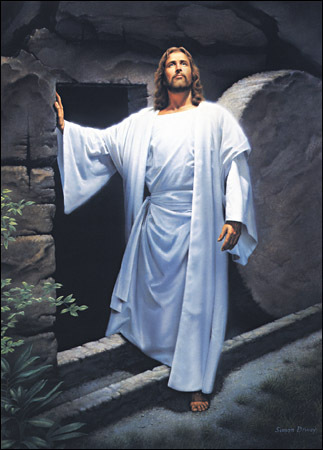 Christ is risen from the dead as He said, Alleluia Alleluia!